WHY DID WE LAUNCH THIS INITIATIVE? We created Somos21 to address a visible gap in the Australia Latin America relations landscape. We noticed that while there were many programs in place to support Australian and Latin American students, and various bilateral and multilateral business councils promoting business and networking opportunities for executive level professionals, there were very few initiatives to promote positive experiences and connections between Australia and Latin America in the young professional demographic. And so we created Somos21, to leverage the passion and drive of our young professionals to establish cross-regional networks that will lay the foundations for stronger relations between Australia and Latin America in the coming decades. We wanted a name that would capture the idea of unity and collaboration across Australia and Latin America within all sectors, industries and professions. Somos21 literally means "We are 21" (i.e. in number - not age!). 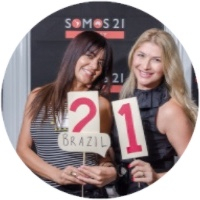 If you go to a restaurant and the waiter asks how many of you there are - you say "Somos21" - "There are 21 of us"
As a network of professionals from the 20 countries of Latin America and Australia, we say the same: Somos21. It equally enables us to create sub-networks based on professions and interests: Somos Abogados ("We are lawyers") Somos Ingenieros ("We are engineers"). Becuase regardless of what divides us and differentiates us, there is still much that unites us.